Yay to Online Shopping Deals! By chance, I came across a blog called My Organized Chaos by a mother of three darling girls in Alberta. I really like it because A. it's Canadian, B. she writes reviews on products that would be of interest to moms and dads alike, and C. she offers baby product giveaways to her readers. So I thought I'd give it a try. Her latest review and giveaway is on Satch and Sol, which is a fair trade artisan that makes children's clothing by hand. And they have some really cute items. As a bonus, Tammi provides a coupon code in her review that will give you 15% off your purchase which, as an added bonus, they will ship for free if it's over $50. And I, who did most of her Christmas shopping online from the comfort of her own home, couldn't resist. 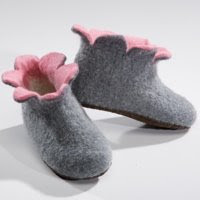 So I succumbed to the lure of online shopping deals and bought a pair of really cute flower cut slippers made of 100% wool for my daughter and another for my goddaughter in anticipation of their summer birthdays. It sure beats last minute shopping! You are too sweet! I seen your comment, as I am moderating and preparing for the big draw. I just had to stop in and visit your lovely blog. Well...back to the big drawing, GOOD LUCK! (I'll come back and visit soon, its really nice to have such great Canadian readers!) THANKS!